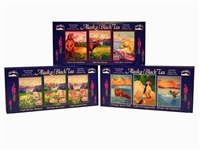 Black Tea has always been a favorite "pick-me-up"in Alaska. Alaskans sometimes mix local herbs with black tea to enhance it, or stretch it out so it will last through the long winter. You can enjoy it iced under the midnight sun, or piping hot under the northern lights. Black Tea is the traditional Alaskan Energy Drink.